QOTW: Is your PC protected against Meltdown and Spectre? If you've been following tech news in 2018, you'll be well aware of Meltdown and Spectre. Identified as critical vulnerabilities affecting numerous processors in widespread use, the flaw affects millions and could give attackers access to private information such as usernames and passwords. It ain't a pretty picture, but the flaws have existed for a while and there are no signs yet that they have been exploited. Manufacturers are responding with numerous software updates to remedy the issue, though the eagerness to patch has in some cases resulted in other bugs and performance penalties. We've had all sorts of fun attempting to update our various test platforms with the latest BIOS releases, and getting protected has been easier said than done. Given that nearly everyone is likely to have been at risk, we're eager to hear what steps you've taken and whether or not your PCs are protected. 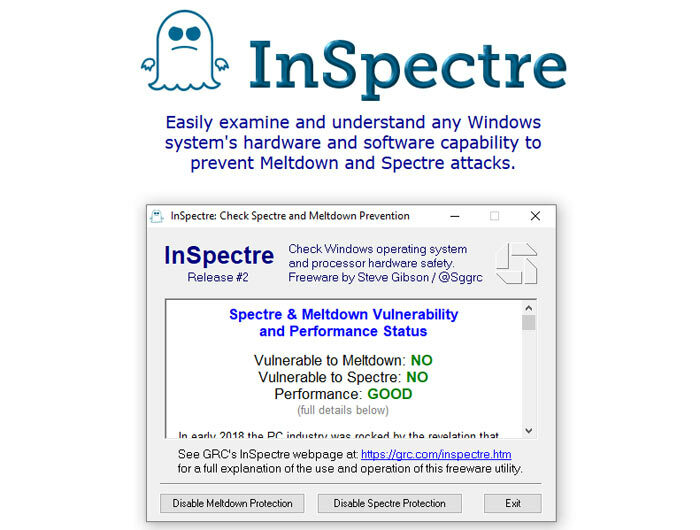 One useful way to find out is Steve Gibson's InSpectre utility, which is free to download from grc.com/inspectre.htm and quickly displays protection and performance status. It's a good idea to check your systems are safe, so take a moment to run the app and let us know how you fare. Yep I have a ryzen cpu and got this message. Yes, I haven't turned it on for about a year. Guaranteed safe. Perhaps I would eventually if I was running W10 and the performance impact was reduced; the chances of MS supplying the microcode for earlier OS' appears to be slim to none. Good luck getting a new BIOS update from your ‘board maker if it’s more than ~3 years old. Who's vulnerable to Total Meltdown on W7/Server 2008, introduced by Microsoft via Windows Updates during January to March and with an exploit available on Github? Everything but spectre although there is a motherboard bios available, I'm just being lazy updating it as I'm due to ‘reinstall’ everything soon so might as well do it at the same time.